SPRINGFIELD, Mass. – Mansfield junior Damani Scott admits he was trying to find his role out in the Hornets’ loaded and balanced offense throughout the regular season. During the postseason, that all changed. 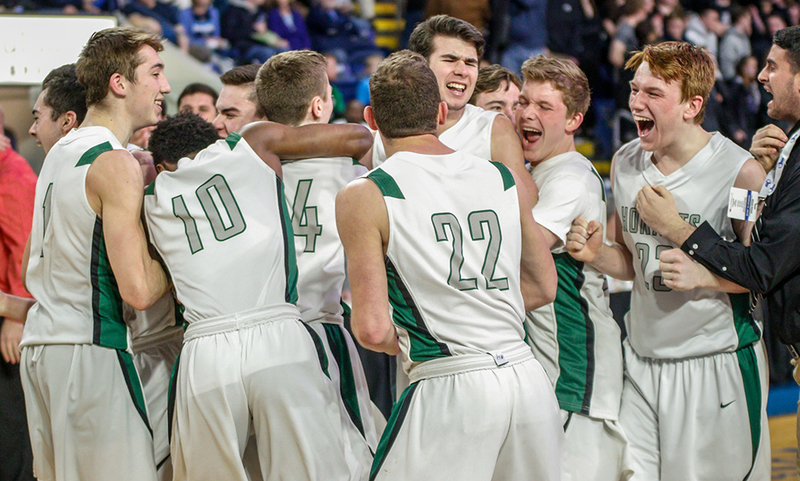 Scott went from averaging under 10 points per game during the 23-game regular season to leading the Hornets in both scoring (18.5 points per game) and rebounds (6.7 per game), playing a monstrous role in helping Mansfield secure its first-ever state championship with a 67-54 win over rival Franklin at the Mass Mutual Center in Springfield. In the state championship against the Panthers, Scott finished with a team-high 19 points. And what has been most impressive about his game during the playoffs is his ability to get it done in multiple ways on the offensive end. His three-point shot has come a long way to the point he’s drawn extra attention on the perimeter. And when the defense does come out, he has shown that he has no problem taking a defender off the dribble to get to the basket for a layup, draw a foul, or both. He shot 50% (5-for-10) from two-point range against the Panthers, drained a pair of three-pointers, and earned his way to the line for six free throw attempts. His steal and breakaway dunk tied the game at the end of the first quarter, capping a 7-0 run to give the Hornets a wave of momentum. And for his play this postseason, there’s little doubt he should be considered the MVP of the Division 1 tournament. Scott wasted little time asserting himself in the playoffs. In the opening round of the playoffs, he went a perfect 5-for-5 from three-point range on his way to a career-high 25 points. From that point on, Scott was locked in. 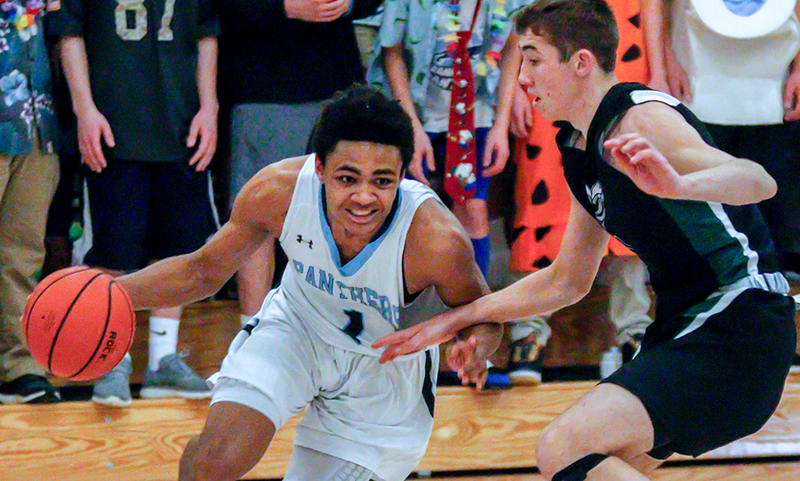 After Boulter put together an epic performance to shoot Mansfield past BC High in the second round, Scott was back at it against the Newton North Tigers. Although he had scored just nine points in the first matchup back in December, Scott showed just how hard he has come this season with an MVP-like performance at inside the Rabouin Field House at Taunton High. He connected on 8-of-12 shooting, dropping a team-best 23 points while hauling in 11 rebounds. The junior was a beast on the boards early on, getting some easy buckets that transitioned into a breakout game. “He played as good as you could,” Vaughan said after the Newton North game. When the Hornets had another rematch, this time against the Boxers of Brockton in the D1 South Final, Scott’s progression was on full display again. In the first go around, Scott didn’t get into double figures for scoring. The second time, Scott played the role of finisher. He scored 10 of his 21 points in the final quarter, helping the Hornets slam the door shut on the Boxers to clinch the program’s first South Sectional title since 2013. And under the bright lights of the TD Garden, where he had scored 13 points on over 85% shooting against Cardinal Spellman earlier this season, Scott dropped 17 points against North champion Everett. He was clutch from the free throw line (8-for-12), hauled in seven rebounds and dished out four assists. SPRINGFIELD, Mass. – Just when it looked like Mansfield would run away the state championship, Franklin stormed back with a big run and had a chance to make it a two-possession game. And no one was surprised because that’s the never-give-up type of team that Franklin is. But when Mansfield was able to weather the storm, keep its lead, and break the pressure to pull away in the final minutes, it didn’t come as a big surprise either, because that’s the team the Hornets have been this season. And with that, Mansfield earned a hard-fought 67-54 win over Franklin to earn the D1 State Championship, the first in program history. Mansfield led by as much as 18 points, up 59-41 with five minutes to play in the game after Ryan Otto (four points, four rebounds) hit a deep two just before the shot clock expired. But true to form, Franklin turned things around. Jalen Samuels (seven points, seven rebounds, four assists) hit a free throw and then took a charge to get some momentum back. Sophomore Chris Edgehill (18 points) hit in the lane and Paul Mahon (14 points) splashed in a three to get the game back to ten, 59-49 with four minutes to play. Out of a timeout he Panthers’ Matt Elias (eight points) picked off a pass at midcourt, leading to another three from Edgehill and suddenly the Panthers trailed 59-52 with three minutes to go. Franklin had three chances to close the gap further but Mansfield’s defense wouldn’t allow it. Mansfield forced three straight empty trips, and then in transition, Mansfield junior Damani Scottt (19 points, four rebounds) drew the defense in and dropped a pass off right under the hoop for an easy two from Otto. The Panthers came up short on the other end again, and Mansfield went on to sink six free throws over the final 90 seconds to secure the win the D1 State Championship. While it looked like it may turn into a blowout in the fourth quarter, Vaughan knew that Franklin would go down swinging to the very end. “That’s a very good team we just played,” Vaughan said of the Panthers. “We made some shots, we did some things we had to do but [Franklin] wasn’t underprepared, this wasn’t a lack of effort by Franklin. If we play this game 10 times, five go one way and five go the other. It comes down to the fact at some point in the second and third quarters, we made a few extra baskets. Franklin coach CJ Neely had a similar outlook, noting that in the end, the Panthers knew it would come down to the small things. The Panthers finished 10-for-22 from the free throw line compared to 23-for-30 from the Hornets. “As much as the hype went on all week, we talked about how at the end of the day, it’s going to come down to a couple of loose balls, rebounding and taking care of the ball, and making our free throws,” Neely said. “At the end of the day, that’s what it comes down to and they [made their free throws]. When you play in this rivalry, if you’re not making your free throws and they are, and they can go from four to an eight-point lead instead of keeping it close. While Mansfield had the key runs throughout the second and third quarters, they needed another one in the first quarter just to keep pace with the red-hot Panthers. Holding a 10-9 advantage late in the first quarter behind a free throw from Samuels, the Panthers got hot from deep. Mahon took a feed from Edgehill and made a deep three, and then repeated the same sequence two plays later for a 16-9 lead with just over a minute to play. Mansfield was able to answer over the final minute though. Hyland drove hard for two, Scott completed a traditional three-point play on a possession the Hornets had because of a steal from Khristian Conner, and then Scott came up with a late steal and went in alone for a thunderous one-handed slam to tie the game after eight minutes. Franklin’s offense picked up where it left off as Elias drained a three to open the second quarter and junior Will Harvey joined in on the three-party with a corner trifecta for a 22-16 lead just over a minute into the second. Hyland hit a three but Edgehill answered with a traditional three-point play to keep the Panther advantage at four. A free throw from Scott cut it to three, and two more from Justin Vine (five points) made it one after he went to the line after hauling in a defensive rebound because Mansfield was in the bonus. 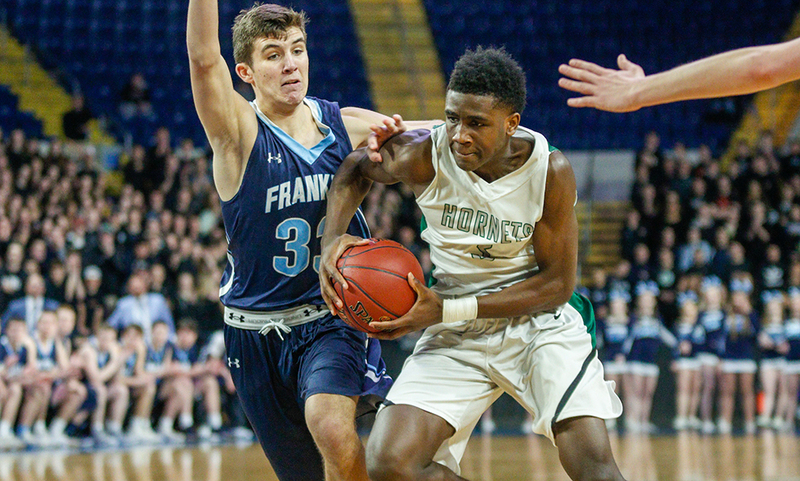 With both Scott and Hockomock League MVP John McCoy (18 points, 11 rebounds) in foul trouble for the Hornets — and Samuels for the Panthers — Mansfield’s Hyland stepped up into the spotlight. Hyland hit another trifecta, this one putting the Hornets up 27-25 with just under three minutes left in the half. Elias hit one free throw to make it a one-point game but Hyland got his layup to fall while fighting through a foul, completing the three-point play at the line. Two possessions later, Hyland once again attacked the basket, draw the foul, and got a kind bounce off the rim for another three-point play, plus a 33-26 lead. Hyland finished with 12 of Mansfield’s 19 points in the second quarter and tied a career-high with 17 points overall on top of five rebounds and four assists. Franklin’s defense came out strong in the second half, holding Mansfield scoreless for nearly the first three minutes of the third. However, Mansfield’s defense was equal to the task and the Panthers only scored once, a layup from Mahon, during that stretch. McCoy drained a three to give Franklin some life, pushing the lead to 38-28. Mansfield went up as much as 14 points in the frame (44-30) on a traditional three-point play from Scott. But Franklin closed with an 8-4 run with Samuels scoring the first four and Elias and Edgehill each contributing two. Franklin nearly had a big stop to keep the deficit in single digits at the end of the quarter, but Hyland came flying in to steal an offensive board for an easy putback. Mansfield opened the fourth with a set play to get two for McCoy, and then ran a set that resulted in a corner three for Vine. McCoy knocked down a pair of technical free throws to stretch it to 55-38. Mahon answered for Franklin with a triple but two more from McCoy at the line, and a deep two from Otto gave Mansfield a commanding 59-41 lead, only for Franklin to charge back with its 11-0 run to make it a seven-point game. “The resilience of this team….we’re never going to go away,” Neely said. “We’re not going to be the team that plays for the newspaper and loses by 10 or 11, we’re going to go out there and try and cut back into it as much and possible, and we’ll lose by 50 but we’ll do it trying to get back into it. Vaughan agreed, stressing the importance of getting a big lead because he knew Franklin would continue to push back. While the Hornets secured their first state title win with a victory over rival Franklin, Vaughan noted his squad focused more on themselves and getting a win than about the rivalry. “It wasn’t really about the opponent, it was just about winning this game,” Vaughan said. “If anything, there’s a part of me that knows how hard it is to get here, and I know what Franklin basketball is all about, and what CJ is all about and most of those kids I’ve coached at some point. They are great kids, great young men. Franklin finishes the season 23-4 and had a second straight appearance in the D1 State Finals. “The guys should be very proud of themselves,” Neely said of his team. “They are working hard year round, they are sacrificing a lot to put Franklin on the map and be one of the powers in the state. We’ve beaten a lot of good teams this season, we didn’t shy away from challenges. They should be very proud of themselves. Mansfield boys basketball picks up its 27th win of the season, finishing with just two losses. BOSTON, Mass. – Just when it looked like Mansfield was out of new players stepping up and taking control, in stepped junior Khristian Conner. It’s only fitting that five years to the date, Conner was able to equal the performance his older brother, Kevin, had in the 2013 EMass Final. 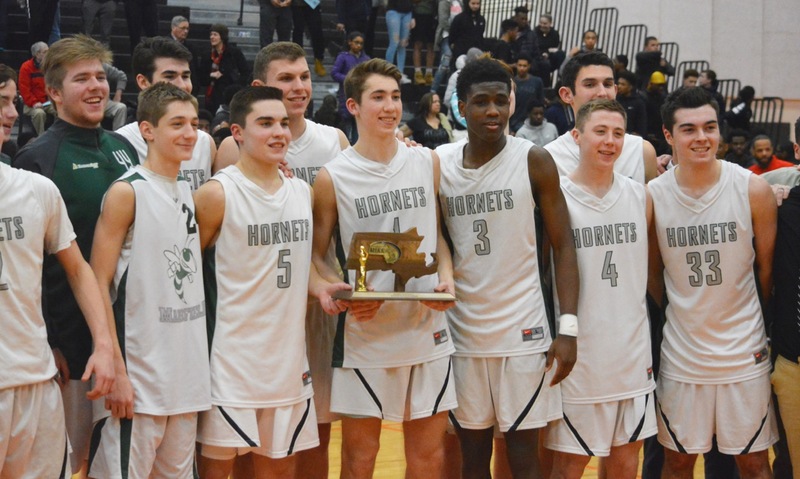 The Hornets have had different players take charge throughout their 2018 postseason run: Damani Scott scoring 25 points against Newton South, Tyler Boulter dropping 35 points against BC High and Johnny Mccoy’s MVP performance against Newton North. We’ve seen the likes of Justin Vine, Ryan Otto, and Tommy Dooling come in and hit a big three or take an important charge. And you can’t forget about the tireless work of point guard Sam Hyland, who has continued to make good decisions on the offensive end while shutting down some of the most formidable opponents on the defensive side. 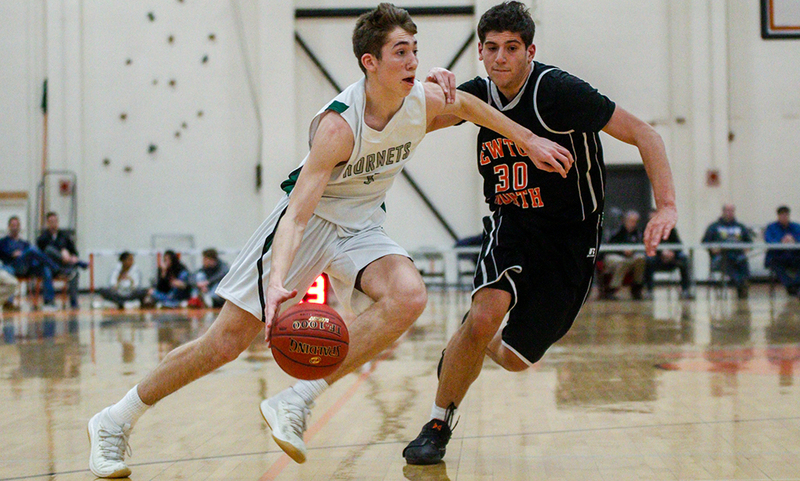 Now with the lights shining brightest, it was Conner that came off the bench and delivered 13 points and three steals to help the Hornets hold off Everett, 73-65. Mansfield advances to the MIAA D1 State Championship and will take on rival Franklin on Saturday in Springfield with time and exact location to be determined. It will be the first time in D1 history that two teams from the same league will meet in the state finals for boys basketball. 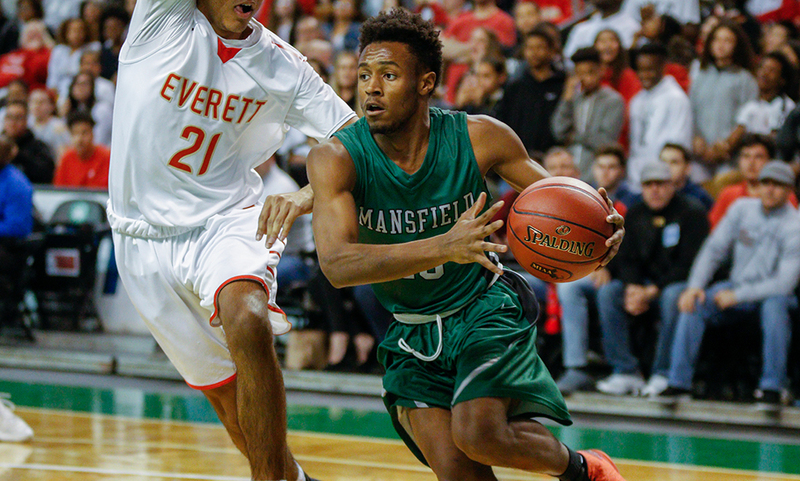 “This was Khristian’s speed tonight…open floor, get out and take the matchup that’s given to you and go and make a couple of plays,” said Mansfield head coach Mike Vaughan. “He couldn’t have played bigger tonight. Conner’s biggest play came with just over three minutes left in the game. After turning the ball over trying to force a pass baseline, it looked as though Everett had a chance to pick up some momentum and cut into the 10-point deficit. Instead, Conner hunted the ball down, coming up with a quick steal just seconds after losing possession and went up for an easy two. That gave Mansfield its largest lead of the fourth quarter, 65-53, with 3:29 to play. On the ensuing trip up the court, Conner used his quickness to get a hand in on the dribble, forcing it to bounce off the Everett player and out of bounds for a turnover. Although Mansfield didn’t score on its turn up the court, the Hornets ran off more time to get under three minutes to play. After McCoy (13 points, five rebounds, four assists) hit one free throw to make it 66-57, Caleb Jacobs answered with a three-point play to get within six with under a minute to play. McCoy responded with two free throws and Isaiah Likely drive in for two for Everett. The Hornets had a turnover against the Crimson Tide press and Everett cashed in with a putback for two, making it 68-64 with 19.4 to play. But Scott (17 points, seven rebounds, four assists) hit a pair of free throws, Everett’s Jalen Iles-Smith only made one, McCoy hit another, Everett threw it away and Scott iced the game with two more from the charity stripe to end the game. Mansfield was able to take the lead between the end of the first and beginning of the second quarters. After going back-and-forth with the Crimson Tide for the first seven minutes, the Hornets finished the opening stanza with a quick surge. Scott splashed in a three from the left side on a feed from Hyland (nine points, four assists, there rebounds), Vine got out in transition for two, and then Hyland went one-on-one to the basket to beat the buzzer for two to give Mansfield a 21-17 edge after one. That momentum carried into the second quarter as Mansfield outscored the Tide 13-2 over the first five minutes of the second quarter. Scott hit two early free throws and then set up Vine in the corner for a trifecta. McCoy had two free throws followed by a strong baseline drive from Boulter. McCoy then followed a free throw with a big three-pointer to make it 34-19 with 2:56 left in the first half. Boulter and Conner helped carry the Hornets in the third quarter. Boulter drained an early three and had seven of his 14 points in the frame while Conner had two straight baskets, a big steal, and a free throw all in a row for the Hornets. Meanwhile, Hyland was at it again on the defensive end. Ghared Boyce, who has over 2,000 career points, scored 22 hard earned points but was held to just 31% shooting with Hyland in front of him. Mansfield boys basketball (26-2) will now take on rival Franklin (23-3), who defeated Springfield Central 61-43, in the D1 State Championship. The Hornets fell at Franklin on January 12th but have won 17 straight games since, including a 59-47 verdict over the Panthers at home on February 9th. “First game they whacked us, second game we were in control for most of the game,” Vaughan said. “A league opponent, going out to Springfield. If this isn’t Duke-UNC at its finest in the NCAA tournament, I don’t know what it is. There’s going to be no secrets. We’re going to know who dribbles right, who dribbles left, who’s girlfriend is named what, what brand of underwear they like [they’ll know] what brand of underwear we like. This is going to be one for the ages. I don’t know if any state title has been done from two teams from the same conference. The game is scheduled for Saturday in Springfield, with exact location and time still to be determined. TAUNTON, Mass. – There are a lot of programs that would love to have the level of consistent success that Mansfield has enjoyed over the past several seasons, but heading into Friday night’s Div. 1 South final at Taunton High the Hornets were not thinking about all the games that they had won in the last five years. The Hornets, especially the senior class, were thinking about the two sectional finals they had reached in the past three seasons, including last year’s loss to Needham on the same court, and focusing on ensuring that the third time would be the charm to bring home the program’s third South title. It was. Mansfield put in another dominant performance on both ends of the floor to beat Brockton 79-65. The Hornets used a 15-0 run in the second quarter to break the game open, led by as many as 24 points, and the 14-point final margin was the closest that the Boxers got in the second half. Few teams are playing as well as Mansfield at this point in the season and even fewer teams are as good when facing a team for a second time. The Hornets avenged one of their two losses by beating BC High by 13 in the quarterfinal and rolled past Newton North for the second time this season in the semifinal. After beating the Boxers by five in a tight game a little more than two weeks before, Mansfield made sure this meeting was nowhere near as close. One of Mansfield’s strengths is the balance it has on offense and in the first quarter six different Hornets scored, including Tommy Dooling who drilled a three after a scramble for a loose ball fell to Ryan Otto and he swung it over to the junior guard. The three put the Hornets up 19-15 after one. McCoy answered a Brockton basket to start the second, but the Boxers got a layup off an inbounds pass to cut the lead back down to just two. The Hornets scored the next 15 and never looked back. Senior Justin Vine (11 points) started the run with a straightaway three off another of Otto’s five assists on the night. Damani Scott also started to get going with a basket off an offensive rebound and a transition basket after a Hyland steal. After the Boxers finally ended the run with a runner, Vine added another three, this time from the corner off a Tyler Boulter feed. Mansfield went into the break leading 41-26. Brockton came out for the third quarter energized but, similar to the game against Newton North, the Hornets always seemed to have an answer to prevent a comeback. The Boxers cut the lead to 15, but Otto (nine points) chased down an offensive rebound and Hyland moved it over to Boulter for a big three in the corner. Boulter would score seven of his 10 points in the third to help stretch the lead, while McCoy continued to take over the game with his ability to get to the rim. The senior, who was greeted by “MVP” chants by the Mansfield crowd after every basket, scored six in the third on his way to a game-high 23. He also pulled down nine rebounds, had a pair of steals, and dished out three assists. In the fourth quarter, Mansfield made sure the game stayed out of reach with stellar ball movement to find open looks. Scott caught fire on the fourth, scoring 10 of his 21 in the final quarter. He buried a pair of threes from essentially the identical spot right in front of the Hornets fans and he capped a near-perfect night for the Hornets with a steal and dunk that put Mansfield up by 24. Mansfield (25-2) will play the North champion, either Everett or Lawrence, at the TD Garden in the state semifinal on Monday night at 7:30. TAUNTON, Mass. – Coming off a loss on the road at Franklin in mid-January, Mansfield head coach Mike Vaughan admitted he wasn’t quite sure where his Hornets fit into a loaded D1 South field. Fast forward nearly two months and those Hornets are now clicking on all cylinders, the proof being a dominant 70-50 win over #4 Newton North. With the win, Mansfield returns to the D1 South Sectional Final for the second straight year, the third time in the past four years, and fourth time in the past six seasons. The Hornets haven’t lost since that game at Franklin High, rattling off 17 straight wins including victories over Hanover (defending D3 state champions and current D2 South semifinalists), Cardinal Spellman, Taunton, Brockton, and Newton South. Mansfield also avenged its lone two losses in that span, comfortably beating both Franklin and just last week, BC High. The winning ways continued on Monday night at Taunton High as the Hornets beat Newton North for the second time this season. Senior John McCoy took over in the second half, scoring 18 of his game-high 25 points after halftime, junior Damani Scott was nearly unstoppable on the offensive end with 23 points and 11 rebounds, and senior Sam Hyland spearheaded an impressive Hornet defensive effort the resulted in Ethan Wright – arguably the best player in the state – scoring just nine points, three of which came in the fourth with the game in hand. “We had to throw everything we had at him,” Vaughan said of defending Wright. Wright scored 32 points in the first meeting back in December. He was held to just nine points on 4-for-10 shooting on Monday night. The Hornets got off to a strong start on both ends of the court. While limiting the high power Tigers’ offense from getting going, Mansfield began to establish itself on the offensive end. Tyler Boulter (11 points) hit an early three and had a strong take to the basket, Scott turned a pair of offensive rebounds — one his own, another from Ryan Otto — into four points, and McCoy added four of his own for a 15-6 lead after one. Scott became the focal point of the offense in the second quarter. He opened the scoring for the Hornets with a traditional three-point play and got by his defender for two right after Newton North had answered. McCoy hit another three and Scott continued to find success at the rim with four straight points, helping Mansfield take a 31-18 lead at the break. Scott scored on the first possession of the second half but picked up two quick fouls on the defensive end, forcing him to the bench. With their top scorer in the game on the bench, the offense switched gears and McCoy took over. Tom Andreae (11 points) cut the deficit to single digits for Newton North but McCoy responded with a traditional three-point play on the other end. 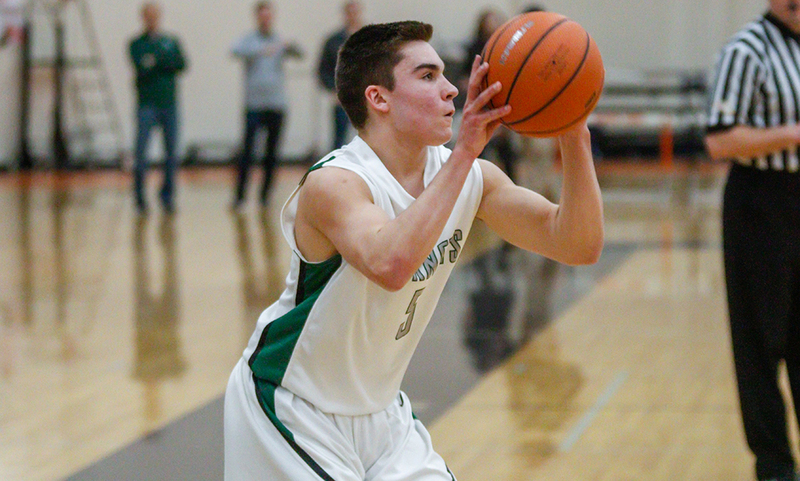 After a turnover, McCoy once again attacked the basket, resulting in another three-point play and a 41-26 advantage. Boulter and Newton North’s Aaron Cooley traded baskets but McCoy couldn’t be stopped. He once again drew contact at the rim, finishing off yet another three-point play for a 46-28 lead. Wright came up with a Mansfield turnover and tried to inject some life into the Hornets with a two-handed slam on the fast break, but the Hornets quickly got the ball up court for an easy two from McCoy, preventing Newton North from building any momentum. McCoy opened the fourth quarter in familiar fashion, taking advantage of a Tiger turnover and then driving to the basket for two points plus the harm – he hit the free throw for his fourth three-point play of the half. “It was definitely nice to see the ball go through the hoop finally,” McCoy said after scoring eight points through the first two playoff games. “I kind of struggled the past two games, but my coaches and teammates told me to just stick with it and keep shooting, and it worked out tonight. After Scott hit a three, Newton North amped its defensive pressure up with a press, resulting in four quick points but after each team traded turnovers, McCoy sank a triple that wrapped the game up. Mansfield led 59-42 with five minutes to play. Mansfield boys basketball (24-4) will take on either Needham (19-3) or Brockton (19-3) in the D1 South Final. If the Rockets beat Brockton, it will be a rematch of last year’s final (Needham won, 65-56). If the Boxers ground the Rockets, it will be a rematch of regular season matchup that Mansfield won 69-64. The game will be at Taunton High with the date and time still to be determined. TAUNTON, Mass. – Mansfield head coach Mike Vaughan mentioned that sometimes when senior Tyler Boulter misses his first three point attempt, it can sometimes take him a while to even attempt a second. That was not the case on Saturday night at Taunton High School. After missing his first look on the opening possession of the game, Boulter connected on his next eight trifectas, shooting 13-for-16 from the field overall en route to a career-high 35 points, leading the top-seeded Hornets to a 71-58 win over #8 BC High. Boulter was just off on his first shoot but two points apiece from Damani Scott, Ryan Otto, and John McCoy had the Hornets off to a quick 6-0 start. It wasn’t until 2:42 left in the opening quarter when senior Sam Hyland hauled in an offensive rebound off a miss and dished it out to a wide open Boulter that the senior got it going. That three created a 12-5 advantage for the Hornets but the Eagles quickly put up six straight to cut it to one. Once again, Boulter came up big with a three, sparking a 7-0 run (Hyland putback, Khristian Conner layup) to end the quarter with Mansfield up 19-11. The Eagles started the second with an 8-1 run to get within a point again, but Boulter had yet another answer dropping his third triple of the game. And on the ensuing possession, Boulter picked off a pass and went in alone for an easy layup. He added a free throw and another transition bucket later in the quarter as well. BC High cut the deficit to five with two minutes left but Hyland converted down low and Boulter hit a triple, giving the Hornets a 36-27 edge at the break. Although Boulter had an impressive first half (6-for-8 FG, 3-for-4 3PT), he had more to offer in the second half, and his shooting became contagious. Boulter opened the half with a three out of a set play but the Eagles landed a counter punch in the form of a 7-0 run to get within three. Of course it was Boulter who put a run to a halt, hitting a trifecta to bump the lead to six. When BC High got it within four, Boulter hit yet another triple off a feed from Hyland and then senior Ryan Otto joined in on the fun with a three of his own to make it 48-38. “I had a moment of deja vu,” Vaughan admitted. In the team’s first meeting, the Eagles used a run early in the third quarter to create the separation they needed to win. “I think we came down and got back to back baskets that got it back to 10 so we kind of weathered it. We talked about how BC High is capable of scoring points in a hurry. [BC High’s Travis] Evee (25 points) is obviously one of the best players in the state and he’s going to get his. Hyland got in on the action with a three, and a few possessions later, Scott deposited his first triple of the game, giving Mansfield a 56-44 lead through three quarters of play. In the third quarter, Mansfield shot 6-for-8 from deep. “It’s about doing what we do within our team structure,” Vaughan said of getting the outside looks. “We’ve seemed to be a better team in the second half of the year when we control the tempo of the offense. Historically we’ve liked to score in transition. This team has found more opportunities running in the half court. They really do a good job of helping each other out and making each other better by setting screens or cutting hard, or just little things that creating more space. Boutler’s three with 6:23 to play made it 62-46, and then he converted through the contact at the rim to make it 66-53. After a monstrous block from McCoy on one end, Boulter took a nice pass from Scott and finished for an easy two. After a steal by Hyland on the defensive end, Boulter put a bow on the win by draining his eighth trifecta of the game. Mansfield boys basketball (23-2) advances to the D1 South Sectional Semifinals. The Hornets will take on #4 Newton North (18-4) on Monday at 7:30 at Taunton High. Attleboro, 44 @ Franklin, 59 – Final – Franklin led by three at halftime (26-23) but broke the game open with a 24-point third quarter. The Panthers outscored the visitors 24-13 in the third quarter to create the big lead. Junior Jalen Samuels led the Panthers with 18 points. Canton, 34 @ Foxboro, 39 – Final – Click here for a recap of this game. King Philip, 39 @ Mansfield, 79 – Final – Mansfield built a 17-6 lead after eight minutes but broke the game open with a 27-point second quarter. The Hornets put the game to bed with a 19-9 fourth quarter. John McCoy (six rebounds, four steals) led the Hornets with 20 points while Damani Scott (five rebounds) and Tyler Boulter each had 10 points apiece. The Hornets hit 13 three-pointers as a team with eight different players connecting for at least one. North Attleboro, 36 @ Milford, 58 – Final – Milford hit three of their six three-pointers in the first quarter and held the Rocketeers to just one field goal, building an 18-4 lead and never looking back. Junior Brendan White scored 17 points, Andrew Fraioli scored 15 points and pulled down 10 rebounds and senior Zach Tammaro had 15 points for the Hawks. Josh Montague led Big Red with 15 points while classmate Jake Petersen had 10 points. Taunton, 71 @ Oliver Ames, 44 – Final – Taunton sophomore Dante Law scored 13 of his game-high 22 points in the first quarter, helping the Tigers race out to a 25-10 lead after eight minutes of play. Taunton led 48-22 and then held the host Tigers to just seven points in the third quarter. Senior Lens Esquil added 16 points for Taunton while classmate Tyler Medeiros chipped in with nine points. Jack Spillane had a team-high 12 points for OA. Stoughton, 76 @ Sharon, 81 – Final – Sharon senior Malik Lorquet led the Eagles with 22 points while both Jimmy Fitzhenry and Demetri Mousis chipped in with 14 points apiece. Sharon led 36-33 at halftime and 59-52 at the end of three quarters. Cam Andrews had a team-high 21 points for Stoughton while David Bell had 16 points and Colin Sanda chipped in with 12 points for the Black Knights. Franklin, 46 @ Attleboro, 39 – Final – Ali Brigham dominated the game for the Panthers, recording 27 points and 28 rebounds in the victory. Foxboro, 81 @ Canton, 32 – Final – Ashley Sampson and Katelyn Mollica each scored 23 points to lead the Warriors, who are one win away from a perfect league campaign. Canton needs one win in its final two games to clinch a spot in the postseason. Mansfield, 51 @ King Philip, 32 – Final – Mansfield broke the game open in the second half after leading 19-16 at the break. With the win, the Hornets clinch the outright Kelley-Rex division title. Maggie Danehy led the way for the Hornets with 18 points and 11 rebounds, while Ann Maher added eight. Faith Roy was KP’s top scorer with 13 points. KP coach Amy Siggens called it a “total team effort” and praised her team’s “aggressiveness” on both ends of the floor. Milford, 45 @ North Attleboro, 55 – Final – Click here for a Recap and a Photo Gallery from this game. Oliver Ames, 63 @ Taunton, 34 – Final – Oliver Ames led by just five at halftime (28-23) but won the game behind a dominant second-half performance. Senior Kayla Raymond had a team-high 16 points and hauled in nine rebounds and Tate Hadges added 10 points and seven boards. Sharon, 37 @ Stoughton, 55 – Final – Stoughton won for the ninth time in its last 10 games to bounce back from a 1-7 start to the season and clinch a postseason berth with two games left in the regular season. The Black Knights also clinched second place in the Davenport division. Aliyah Wright (four steals) was the top scorer with 16 points, while Lindsay McDonald and Sydnee Hyacinthe (eight assists) each added 10. Kaitlyn Wallace had 12 for the Eagles and Miranda Cheung had nine.